Acts 13:13 Now Paul and his company set sail from Paphos, and came to Perga in Pamphylia. John departed from them and returned to Jerusalem. Acts 15:38 But Paul didn't think that it was a good idea to take with them someone who had withdrawn from them in Pamphylia, and didn't go with them to do the work. pam-fil'-i-a (Pamphulia): A country lying along the southern coast of Asia Minor, bounded on the North by Pisidia, on the East by Isauria, on the South by the Mediterranean Sea, and on the West by Lycia (Acts 2:10; Acts 27:5). In the earliest time, Pamphylia was but a narrow strip of low-lying land between the base of the mountains and the sea, scarcely more than 20 miles long and half as wide. A high and imposing range of the Taurus Mountains practically surrounds it upon three sides, and, jutting out into the sea, isolates it from the rest of Asia Minor. Its two rivers, the Cestrus and the Cataractes, are said by ancient writers to have been navigable for several miles inland, but now the greater part of their water is diverted to the fields for irrigating purposes, and the general surface of the country has been constantly changed by the many rapid mountain streams. The level fertile coast land is therefore well watered, and the moist air, which is excessively hot and enervating, has always been laden with fever. Several roads leading from the coast up the steep mountain to the interior existed in ancient times; one of them, called the Kimax or the Ladder, with its broad stair-like steps 2,000 ft. high, may still be seen. Beyond the steps is the high land which was once called "Pisidia," but which the Romans, in 70 A.D., made a part of Pamphylia. Pamphylia, unless in pre-historic times, was never an independent kingdom; it was subject successively to Lydia, Persia, Macedonia, Pergamos and Rome. Because of its comparatively isolated position, civilization there was less developed than in the neighboring countries, and the Asiatic influence was at most times stronger than the Greek As early as the 5th century B.C. a Greek colony settled there, but the Greek language which was spoken in some of its cities soon became corrupt; the Greek inscriptions, appearing upon the coins of that age, were written in a peculiar character, and before the time of Alexander the Great, Greek ceased to be spoken. Perga then became an important city and the center of the Asiatic religion, of which the Artemis of Perga, locally known as Leto, was the goddess. Coins were struck also in that city. Somewhat later the Greek city of Attalia, which was rounded by Attalus III Philadelphus (159-138 B.C. ), rose to importance, and until recent years has been the chief port of entry on the southern coast of Asia Minor. About the beginning of our era, Side became the chief city, and issued a long and beautiful series of coins, possibly to facilitate trade with the pirates who found there a favorable market for their booty. Pamphylia is mentioned as one of the recipients of the "letters" of 1 Maccabees 15:23. Christianity was first introduced to Pamphylia by Paul and Barnabas (Acts 13:13; Acts 14:24), but because their stay in the country was brief, or because of the difficulty of communication with the neighboring countries, or because of the Asiatic character of the population, it was slow in being established. 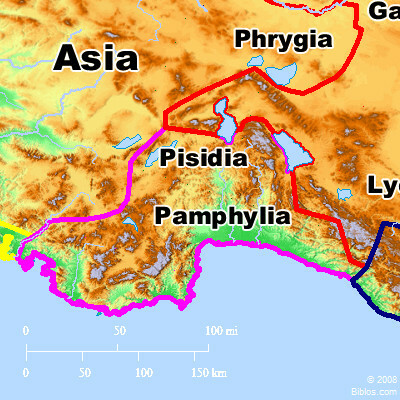 PAMPHYL'IA, a Roman province in Asia Minor, bounded e. by Cilicia, n. by Pisidia, w. by Lycia, and s. by the Mediterranean. Perga appears to have been the capital and Attalia its chief seaport.